Are you dreaming of wearing a very fashion watch? 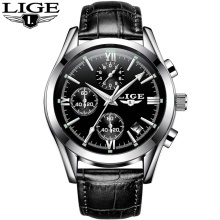 This watch is a popular dress wristwatch for people in work and daily life. If you want to be more charming, this watch is your good choice! Quartz movement offers more accurate time display. Stainless steel /Leather band, durable and comfortable to wear. Mineral glass mirror, protect your dial from scratching. Fashion design, three small dials give you convenience to watch time. Suitable for outdoor sports or travel. Perfect for many occasions, not only at home, but also in the office, showing your charms at all times! Functions: Time, calendar display and luminous function.